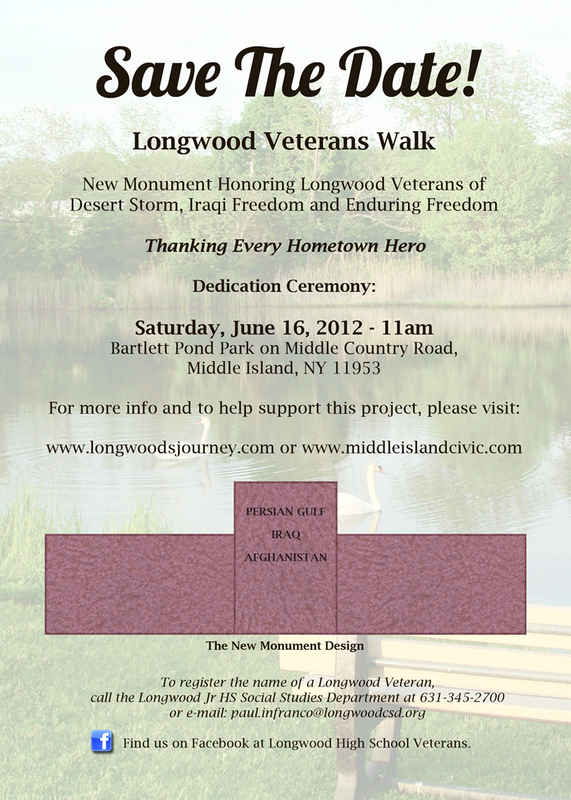 A ceremony to unveil the final monument will take place on Sat., June 16 at 11 AM, at the park, located on Middle Country Rd., Middle Island. Rescue Wing, New York Air National Guard, will open the ceremony. 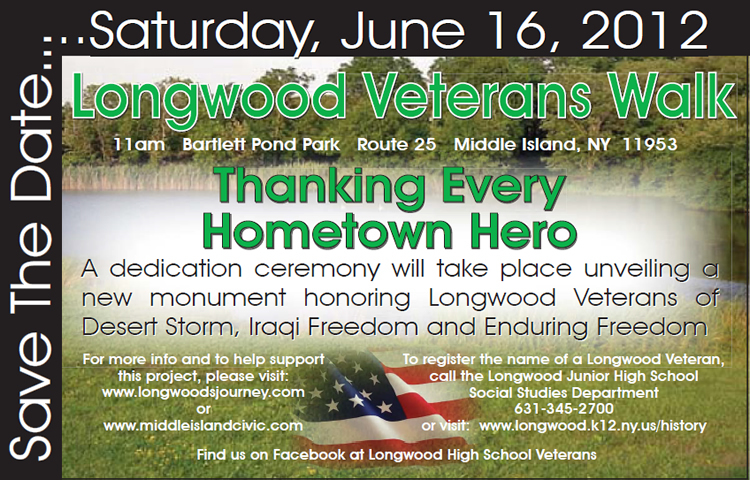 Each veteran, active serviceman and woman will be recognized individually and presented with a medal and Longwood veteran hat. A bound collection of their student-written biographies will be distributed to the honorees. renewed interest in local, living history here in Longwood. Our kids and then our community soon realized that every veteran has an important story to tell, and that every veteran deserves to be recognized,” he said. included the National Archives, the Suffolk County Historical Society, the Town Historian’s office and the Longwood Public Library. The result was six volumes of biographies. Their research inspired subsequent funding. the Town of Brookhaven Parks Department. “The names on the monuments at Bartlett are our way of ‘Thanking Every Hometown Hero,’” said Gail Bailey, president of the Longwood Alliance and a chief organizer of the project. “We hope the park will always be a place of recreation and reflection. Granite last a long, long time. So should our gratitude to our veterans,” she said. Due to limited parking, guests are encouraged to park at the Middle Island Fire Department, 31 Arnold Dr., Middle Island; or Longwood Middle School, 41 Yaphank Middle Island Rd., Middle Island, by 10 AM. Shuttle buses will be provided from both locations to the park. 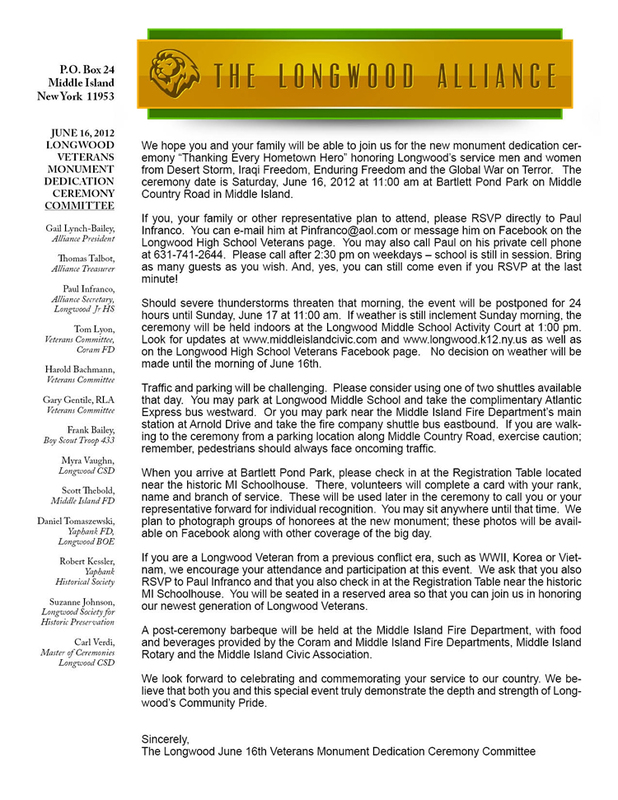 Participants are invited to a community barbecue at the Middle Island Fire House following the dedication. The rain date for the dedication is Sun., June 17 at 11 AM. If it rains on Sun., the ceremony will be moved to Longwood Middle School at 1 PM.